Belmont University’s chapter of Phi Mu sorority recently hosted their annual fall philanthropy event, BonnaMu. This years event, dubbed BonnaMu Unplugged, featured an appearance from a big name artist that was sure to draw a crowd, Hunter Hayes. Through fundraising efforts of both ticket sales and an online fundraiser, the organization was able to raise a total of more than $63,000 for their philanthropy, Children’s Miracle Network. Before Hayes made his headlining appearance, several student performers were featured as opening acts including Taylor Bickett, Sydney Dumler, Delaney Schueler and Maggie Renfroe. BonnaMu was organized by Phi Mu philanthropy chair Britney Sams who said she wanted to change the feel of the event this year and make it more intimate, hence the Unplugged name. Sams said bringing in Hayes to play came from a desire to make the event bigger than it was in previous years. “I knew that I wanted to make BonnaMu a larger event than it had been in years past. With Belmont’s huge influence in music, I thought that this event had so much more potential to be filled, so we gave it our best shot to bring it up a notch this year,” she said. 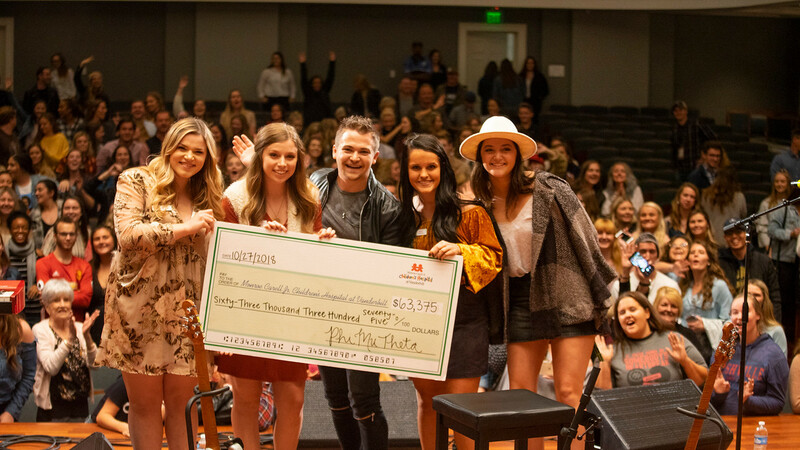 Money raised from the annual event, which took place in McAfee Concert Hall on campus, will go to support the local Children’s Miracle Network hospital, Monroe Carell Jr. Children’s Hospital at Vanderbilt.